Dam Safety Monitoring Officer with the Zambezi River Authority, Ernest Katonga took IPS on a tour above and under the wall which holds back some 64,800 Mm3 of water in the reservoir. He indicated a variety of instruments used to monitor the integrity of the wall. These include beacons, pendulums and even simple plaster of paris patches that are stuck onto the wall where cracks develop. Cracking and widening of the cracks on the strips, measured by sophisticated instruments, indicates a serious problem but so far, all the cracks have been superficial. 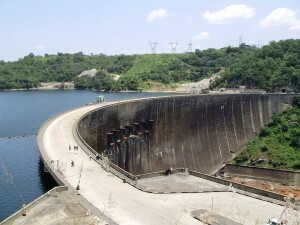 Katonga revealed that the wall has shifted some twenty millimeters towards the reservoir. This, he said, is caused by expansion of the structure and is no cause for alarm, “Expansion can be as a result of heat and temperature changes,” he explained. He however added that, the expansion was reversible, which means that with cold temperature the wall could shrink back to its original condition. He said the way the dam wall was built allows for this expansion and contraction so it is was expected to happen. The monitoring of the dam wall is important because it not only guarantees the safety of the people and property downstream but the provision of electricity to Zimbabwe and Zambia, the co-owners of the dam who depend on it for some of their power supply.